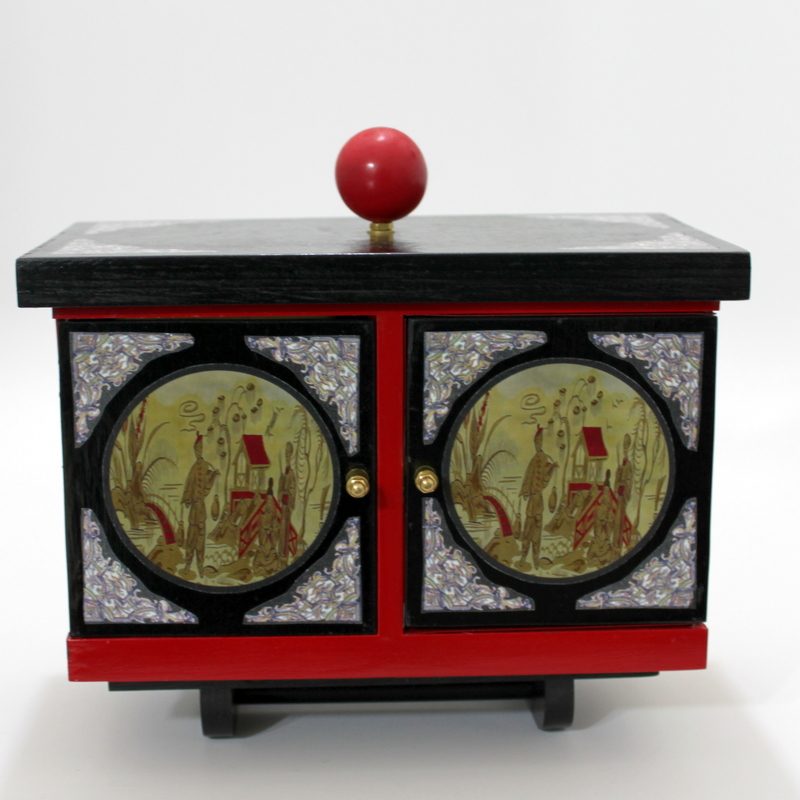 A beautiful version of the classic (and very rare) Wessex Die Box made in Okito style with an improved surprise ending! 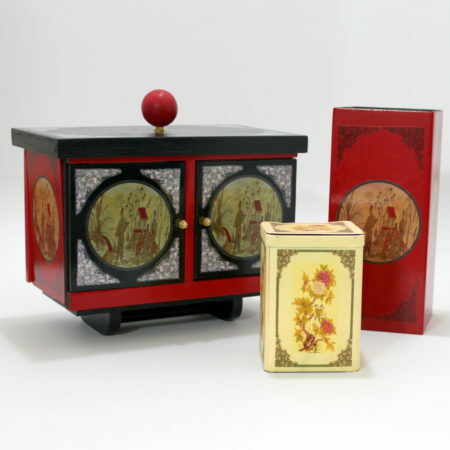 This style die box, in which the entire box transforms at the end into a tray of drinks, was created by Arthur Culpin and made famous by Bill Stickland as The Wessex Die Box and marketed by Supreme Magic Company. 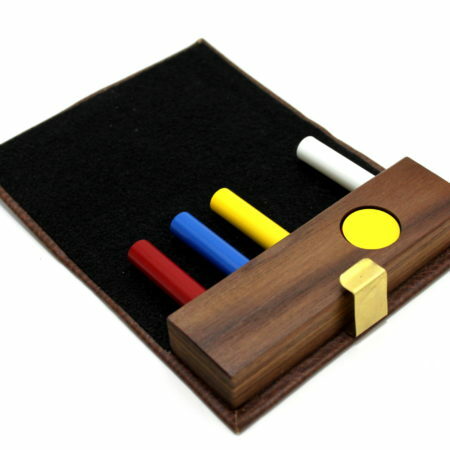 They seldom appear for sale and are highly coveted by collectors of rare apparatus (and obviously, die boxes!) This unique version is from the same craftsman who did work for Dr. Albo’s famous series ofmagic books and videos. His improvements, especially to the climax ending, are wonderful. 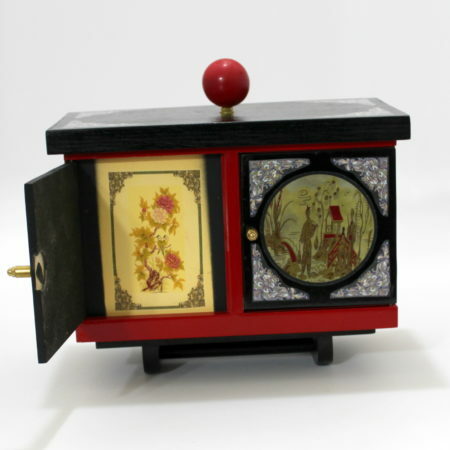 The box is finished in an Okito style, and instead of a die, a tea canister is used for the funny and baffling routine. A tea canister is displayed and dropped into an open end tube. The performer states that the canister will vanish and reappear inside an empty chest with two doors on the front. This chest is shown empty in a deliberately suspicious manner, as the performer opens only one door at a time, tipping the chest from side to side. He again shows the canister inside the wooden tube, then gives it a flick and the tea canister vanishes! The tube is shown empty. One door of the chest is opened, and the tea canister is seen inside. 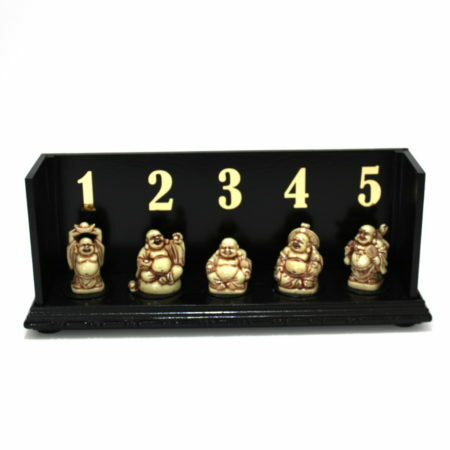 The performer now states that the tea canister will vanish again … and from here the standard die box is performed. The “vanished” tea canister is heard to slide back and forth as the chest is tipped. When the audience has yelled enough to open both doors at once, the performer exclaims in exasperation that he “needs a drink”! 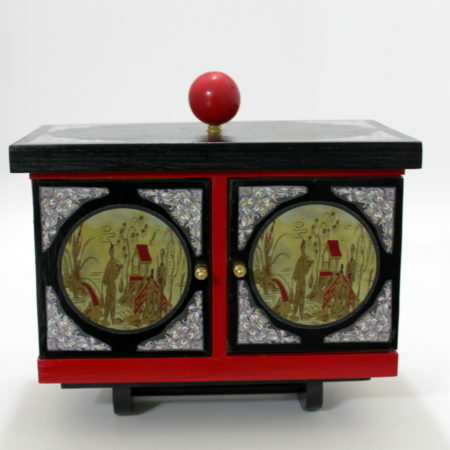 Removing the lid of the chest, the entire cabinet instantly transforms into a very large serving tray with decorative cloth which holds a large bottle of Sake and six small white Sake cups! The bottle is lifted and the rice wine is poured out into the cups for a startling climax! the Sake bottle on the tray is much taller than the chest it came from! It’s been cleverly engineered (and hand spun) to collapse while concealed in the chest and instantly expand upon production. Yet the bottle will hold six: ounces of liquid, enough to fill all the cups. The method of concealment ensures that no liquid will spill during handling. the cloth for the tray has been specially treated to prevent any damage from liquid spills. The Sake cups (which are a great improvement over the often broken shotglasses of the original) each rest on a small wooden coaster and can be removed for emptying/cleaning. the chest has been specially redesigned so that it rests on the table before being picked up without the need for an additional stand. 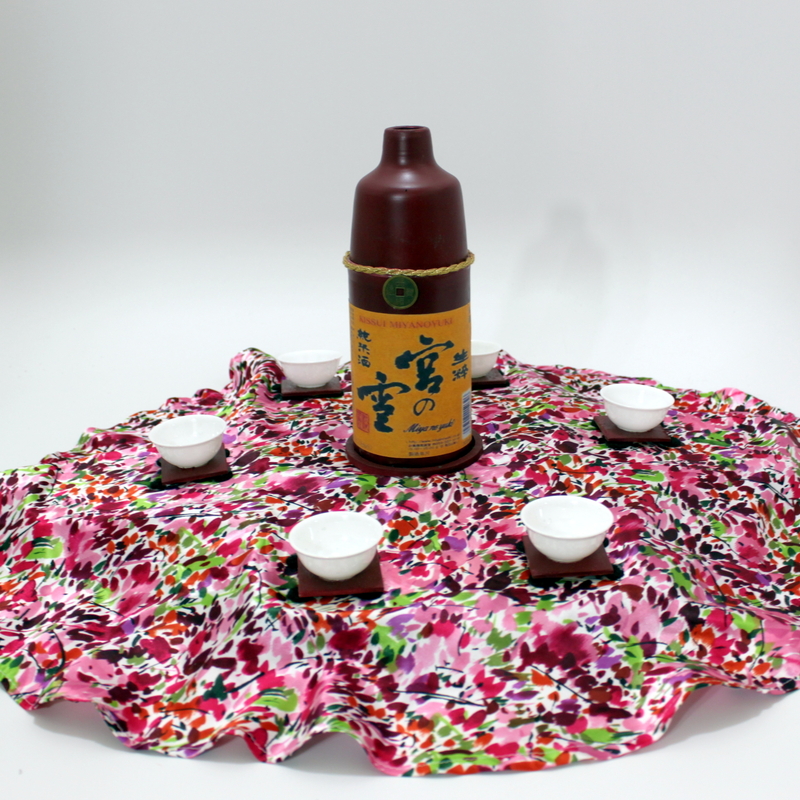 the use of a tea canister and final production of Sake bottle and cups ties the Okito theme together perfectly! Complete with decorative tea chest, tea canister, wooden chimney, mechanical bottle, cups and a photocopy of the original Wessex instructions. Also included is a DVD explaining the setup and working. This is the latest in the wonderful recreations of magic of olde from Joe Long and his Limited Editions Magic series. I have never even heard of the original and have also not seen a die box with anything but dice and cubes so this one was a real surprise. In effect you show the tea chest to be empty by opening both doors at the front. Then you take the tea caddy and place it in the red tube. 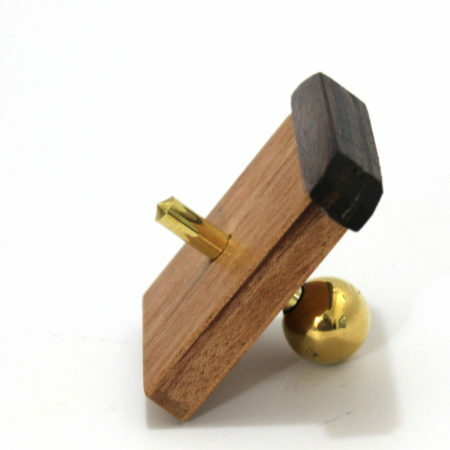 From here it quickly disappears and is found inside the chest by opening up the left hand door. Here you can go in to the familiar sliding routine as the caddy slides back and forth. Eventually the caddy vanishes from the chest. You then take the lid off and the chest "explodes" into a tray with 6 Sake cups and a full size Sake bottle, way bigger than the height of the chest. You then proceed to pour 6 drinks from the bottle and wish everyone good health! A very visual and exciting climax to a more familiar die box type effect. This was made in a very limited edition of 12 pieces, so they are pretty hard to come by. Highly Recommended for Magic Collectors everywhere!